This compact designed, water resistant GPS tracker can easily be hidden to track motorcycles, electronic bikes, golf carts, and other vehicles. 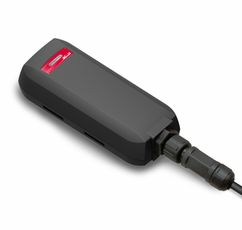 Using the included power harness kit, simply connect to your vehicle and start tracking. With 1-Year of Premium tracking service that includes 1-min location updates, geofences, alerts, and reports, you can view the location of your vehicle or asset through our web-based portal or mobile apps for iOS or Android devices. Additional trackers can be added to your account for applications such as locating your fleet of service bikes/trucks/golf carts or for theft recovery.